After a long, busy summer of developing duckweed production, we’d like to share what we’ve learned about this amazing plant and how it can be grown for a wide variety of uses. In conjunction with Mother Earth News’ Farm Tour month, you are invited to take a tour of GreenSun’s duckweed farm this coming Saturday from 10-2pm. 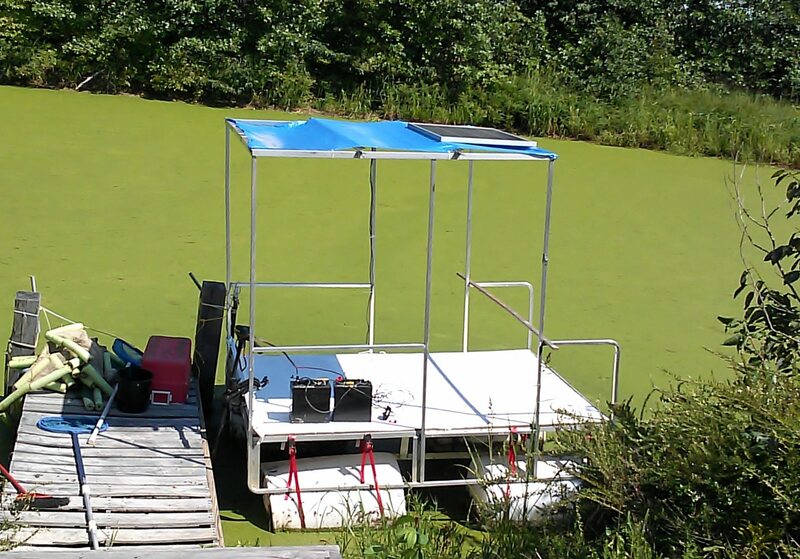 Experience duckweed pond harvesting, processing, and solar drying. Wine tasting on the pond bank and a good time had by all. Bring a picnic lunch and a fishing rod if you like. Car parking is available nearby. All visitors will be escorted in via truck due to the location. When: Saturday September 14 10-2pm If rained out, date moved to Saturday Sept 21. I work at a Wildlife Park in Florida, and we have Duckweed on our alligator enclosure. I want to include your positive uses of Duckweed I read on the internet. May I have your permission to include it in our volunteer newsletter? I will certainly include your name and the research you do. Samuel, that is great! Looking forward to meeting you in person. If you can give me number of folks you are bringing later in the week, that would be wonderful. awesome! We will be there. I’m also going to try and bring a few friends.